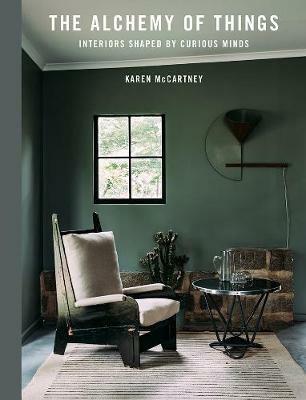 If you have read The House that Pinterest Built, Smart Spaces, Iconic Australian Houses, or Elements of Style, you're going to love Karen McCartney's new book The Alchemy of Things. Karen McCartney's eighteen most fascinating homes in the world: The Alchemy of Things invites you into the homes and minds of eighteen fascinating UK, Australian, US and European creatives selected by esteemed interior design editor and author, Karen McCartney. These artists, interior designers, architects, collectors, gallerists, stylists, furniture designers and vintage retailers take you on an eccentric, whimsical, curated and clever tour of their interior design and home decor, and the philosophies behind their creations. An esteemed interior design editor and author: Author Karen McCartney is best known for her work in the world of interiors, architecture and design across print and digital media. She edited Marie Claire Lifestyle and was the founding editor of Inside Out magazine before becoming Editorial Director (Lifestyle) at News Corp Australia. Karen is the author of eight architecture and interior design books including the bestselling 50/60/70 Iconic Australian Houses, 70/80/90 Iconic Australian Houses and more recently, Perfect Imperfect: The beauty of accident, age & patina. According to Karen, the idea for The Alchemy of Things arose out of her previous book, Perfect Imperfect, where some of the content revolved around remarkable people with quite extreme interiors - people such as Martyn Thompson in New York and Nectar Efkarpidis in Canberra.